In my previous post I raised some doubts about AP McCoy’s price. I therefore thought it a good time to get some selections on board. Lewis Hamilton won SPOTY last year and if he wins the F1 title again this year, becoming the first British driver to retain it, then he should go close to winning again. He looks to have the beating of Rory McIlroy for one judging on last year’s voting. I’m not sure he will win it but his odds should hopefully shorten at some point over the summer if he builds up a lead in the championship. 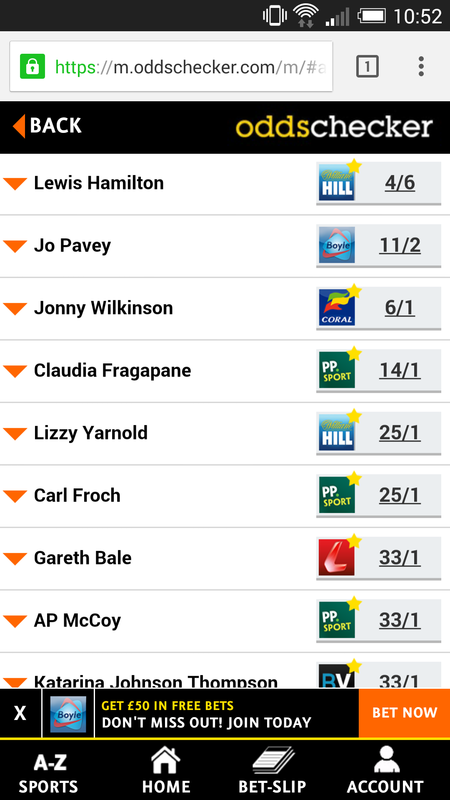 For example, by May last year he was 7/4 favourite for SPOTY. At the moment he is heavily odds on to win the F1 title so this means we can lay off our stake in that competition with minimal downside with a good chance of a greater upside if he contracts a fair bit in the SPOTY market. This summer should hopefully see an intriguing battle between old SPOTY favourite, Jessica Ennis, and the young pretender Johnson Thompson. It remains to be seen how quickly Ennis will return to form following having a baby last year, and with Johnson Thompson in fine form with a good chance of heptathlon gold in the Beijing World Athletics Championships in August, I think it is worth backing her for SPOTY at this stage. I seem to have backed Mo for SPOTY every year for as long as I can remember without success. He has though traded at short prices on a couple of occasions, and I think there is a good chance he can trade a lot shorter than the current 50/1. Following his slightly disappointing display in last year’s London Marathon, Mo has got himself back in good form, breaking the European half-marathon record recently, and should be favourite to win at least one of the 5,000m or 10,000m in Beijing. There’s not been much to report SPOTY-wise recently – barring a big surprise it’s all but over with Rory McIlroy 1.12 on Betfair and a best-priced 1/8 with the bookies. Hype around the night has been at a minimum – just as well many will say! There are still plenty of markets to play in though with the Without-McIlroy market, the top 3 market etc. By the time of the night on Sunday 14 December 2014 there will be markets for each of the ten finishing positions. The shortlist of ten is selected by a panel and announced on BBC One’s The One Show on Monday 24 November 2014 – full details here. Will Bale be on the list? You’ve got to think he must be – a) he would be the only footballer on the list b) he scored in, and won, the European Cup Final c) he’s the only British footballer on the shortlist for the Ballon d’Or d) he’s still the world’s most expensive footballer e) Wales have a chance of being top of their qualifying group for the European Championships on SPOTY night and, in any event, have a good chance of qualifying. 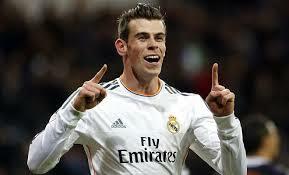 Assuming Bale makes the shortlist then what are his chances of getting votes? I think they are pretty good. Carl Froch – There was a lot of publicity surrounding his fight with George Groves. That was back in February and I am not sure he has really captured the imagination of the wider public. Lizzy Yarnold, Claudia Fragapane, and Jo Pavey – There appears to be a groundswell of support for women to be further represented in SPOTY and it could be that these women get a fair amount of publicity – in particular, Pavey who impressively won the European 10,000m gold at 40. How much this will transfer to votes is the question. I have my doubts about this mainly based on how much their actual performances were recognised by the wider public. On balance, I am not convinced many people will actually remember them and vote for them. Based on that I think they are short in the market. Jonny Wilkinson – I can see how there could be a Ryan Giggs-2009 element to Wilkinson’s popularity this year, plus he won the European Cup in his last game. That said, he has already won the SPOTY award in 2003 and, while he remains extremely popular, his actual achievements this year are no better than Bale’s. The emotional vote could kick in but when there is such a short-priced favourite, such as McIlroy, my intuition is that this will dampen such a vote – people may think, ‘what’s the point?’. Lewis Hamilton – He’s the obvious obstacle at 4/6. I wouldn’t bet on it though, as while he is the likeliest runner-up, I remain sceptical as to his wider appeal and that of F1 these days. A terrific driver, he failed to win SPOTY in 2008 despite winning the championship and being the heavy favourite. He also has to win the F1 title this year which is no formality, although he is 1/3 to do so, and with double points available on the last race of the season anything can happen. Again, as with everyone, there could be a dampening effect on votes for Hamilton due to McIlroy appearing such a certainty. So with Bale at 33/1 I think this is a terrific bet. He has produced some memorable performances for club and country this year, is a likeable lad and instantly recognisable to a large proportion of the population. But most importantly he is Welsh. The Welsh have consistently got behind their own in large numbers with Joe Calzaghe, Giggs and Leigh Halfpenny (2nd last year to Andy Murray) recently benefitting. I can see Bale being nominated for the shortlist and his odds trading much, much shorter on the night than the current 33/1. While he may not finish runner-up we can trade out for a good profit. I think the markets are set up quite nicely at the moment for us to strike with two selections. I think Lewis Hamilton is setting up the market with some value at the moment. Even if he wins the F1 title I think he is a vulnerable SPOTY favourite. And I have to discount any England footballers getting too involved in the market barring Owen or Gazza type heroics. Could happen but we have to deal in likelihoods in this game. So come July time I think it is set up for two old faces to be at the forefront of SPOTY thinking – Froome and Murray. Murray comes first at Wimbledon defending his title. He’s been without a coach for a while now since Ivan Lendl left. But as I write he has put together a determined run at the French Open. He’ll probably lose to Nadal in the semis tomorrow – Nadal is 65-1 at Roland Garros (one of the great records in the history of sport) but importantly he has shown that he is over his back operation. He has a fantastic record at Wimbledon and I expect him to be very hard to beat there. Murray is not everyone’s cup of tea but he’s one of my favourite sportspeople to watch. 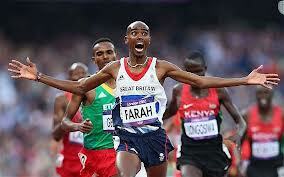 Along with Mo Farah I think he is Britain’s best sportsperson. We all know what will happen to his SPOTY price if he goes well at Wimbledon (SPOTY held in Glasgow this year too). I think he represents good value at 14s. You may wish to consider laying off some of your stake on Betfair where he is 4.4 for Wimbledon at the moment but could well go shorter in the next weeks. Murray also has the US Open later in the year. If Murray doesn’t win Wimbledon then Froome has the opportunity to take centre stage later in July. The Tour starts in Britain this year so I expect there to be a fair amount of hype. Although I am not sure if Froome has the appeal to actually win SPOTY, I am sure he will trade fairly short straight after winning the Tour – at which time we can look to green our books. The beauty of this bet is that we can trade our stake for a short price in the Tour market.